But if you say we’re going to Bath City Farm for a walk you get a much more positive response as it starts and finishes with the farm animals. The one-mile circular family nature trail around this countryside gem has something for everyone. Its distance is just about right, there are amazing views towards the Royal Crescent and there is loads of great wildlife to look out for. In fact the best thing about this walk is that just when you think the kids are starting to flag something pops up to re-charge their batteries and they skip across the fields. Set up in 1995 Bath City Farm is the biggest in the South West of England. Amazingly it’s been used for agriculture since farming began thousands of years ago and has a really important role in connecting people with food and farming. Starting where the Gloucester Old Spot pigs live the nature trail heads westward along an easy access path; often sheep, cows or the Shetland ponies can be found grazing in the field. When you walk through a kissing gate into Keltson Copse there is a little bench, slightly hidden from view, and it’s worth the slight detour to have a quick sit down. This is a great spot to gaze out across the cityscape looking for well-known landmarks. And as you continue on your journey you feel like you’re in your own secret little kingdom with loads of wildflowers, lichens and mosses clinging to the trees. You’ll also be able to tune into the birdsong that fills the woods with sweet melodies. Then you either head towards the hobbit trees or take a shortcut down the hill along a line of majestic beech trees planted in 1830 to act as a windbreak against the south-westerly winds. In the spring this is where you’ll find the bluebells and look up for those beautiful luminous green leaves on the trees. By autumn they’ll have crisped up into golden browns and even in winter they look stunning. The hobbit trees are great as the kids can get right into them and look out for beetles or ladybirds. Heading back towards the farm you follow the line of a classic hedgerow. There is something really special about hedgerows: the skill involved in laying them and the wonderful diversity of the things that you can find in them from hazel to hawthorn. A great new addition to this walk is a woodland play area near the line of beech trees. With two ropes swings and a suspended walk way between the trees, this is a great natural spot for a snack and drink. As you walk towards the southern slopes of the farm you get a real sense of the patchwork of fields, all with their own names such as Maiden Furlong or Broads Sideland. En route to the pond there is a disused air raid shelter where a family of foxes has moved in to bring up their young. Ponds are like magnets for children. The scale is just right for them and you never know what might be lurking. It is a great place to stop, stand still and see what moves. Frogs, newts and dragonflies all call this place home and in the summer you can see the beautiful yellow flag iris and water lilies – a great chance to get the camera out. From here you’re nearly there, walking pass the community allotments, orchard planted a couple of years ago and the field of sheep. Then you’re back at when you began with the goats and hens. 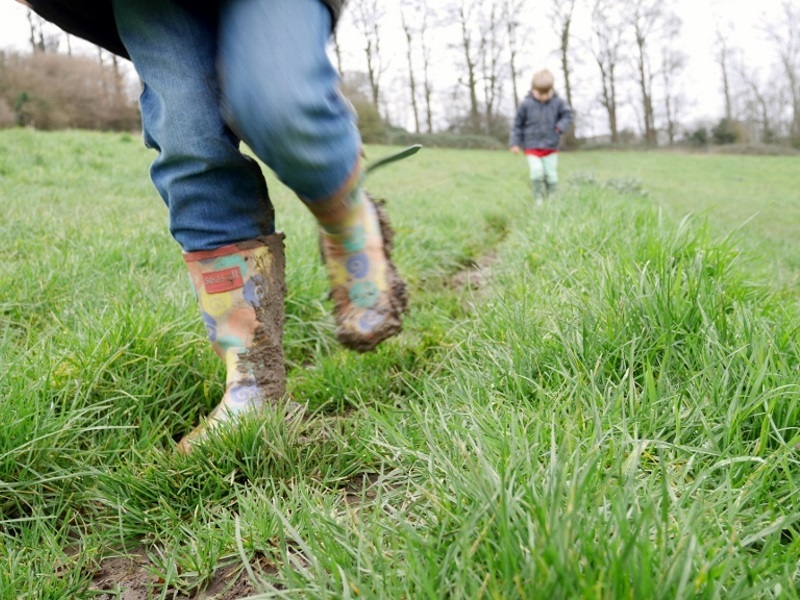 You can download a free route map for the family walk at Bath City Farm here. Thank you Mike for the great blog post and photo.